What an exciting day. Three eggs have hatched. 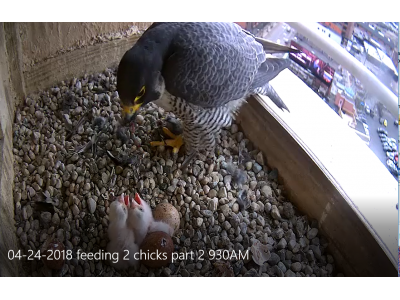 The first two eggs hatched in the morning and chicks were fed for the first time around 9:30 AM. Activity could be seen in the hole in the third egg during an afternoon feeding shortly after 3 PM. The third egg hatched around 5:30 PM. Let’s hope the 4th egg is not far behind. The live stream feature is now active, so you can choose that option from the home page and watch and listen in real time!